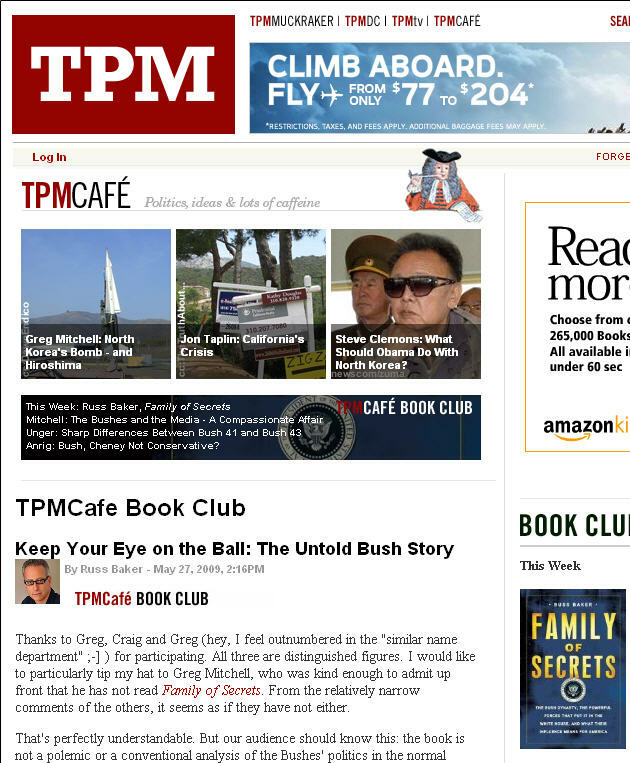 This week, TPMCafe Book Club is featuring Family of Secrets. Russ has kicked off the conversation with an introduction to the book. Respondents include fellow authors Greg Mitchell of Editor & Publisher, Greg Anrig of The Century Foundation, and Craig Unger. You don’t want to miss this discussion. And don’t be afraid to add your two cents in comments . . . or to click on the “recommend” bar. Here’s another new Russ Baker radio interview with “Liberal Oasis,” broadcasting from Western Massachusetts. The interview with Russ begins slightly less than half way through the mp3. Listen to Russ Baker in an interview with WSLR (Sarasota, FL) conducted just last week. Family of Secrets is a Reader’s Pick over at the Christian Science Monitor website. Read more here.